We’ve been living in France for nearly 10 weeks, and our remodel is progressing slowly but steadily. Back in December, when we received the keys to the house, we had planned on working with a construction company who would handle the entire renovation project, but their contractual bid came in at over double their original quote, so we had to find another solution. Rather than looking for another large construction company, we decided to manage the project ourselves with a team of independent artisans. This has meant staying in France longer than we originally planned, delaying our return to Bali to oversee our project there, and accepting the fact that we will won’t be able to rent out the château this summer as a trial. Initially this felt like a major setback, but it has turned out to be a blessing in disguise. It has taken us some time to recruit contractors and wait for them to become available to start work, and we’ve also faced some delays in receiving supplies – but these delays have allowed us time to get to know the house. We have subsequently dramatically changed the plans we originally devised in December with the construction company. Looking back, we were rushing our decisions, and would have made expensive, avoidable, and regrettable mistakes as a consequence. For example, we had planned on transforming the current laundry room into a formal dining room. However, since living in the space, and seeing the beautiful South-facing light on that side of the house, we realize that it’s better suited as a living room. In turn, the wing which was going to be converted into the living room can now be used as an orangerie and event space. Justin and Rosie, at work in the grounds. Another big development is our realization that we would like to find a couple to live on the property with us, as caretakers and guardians of the chateau. 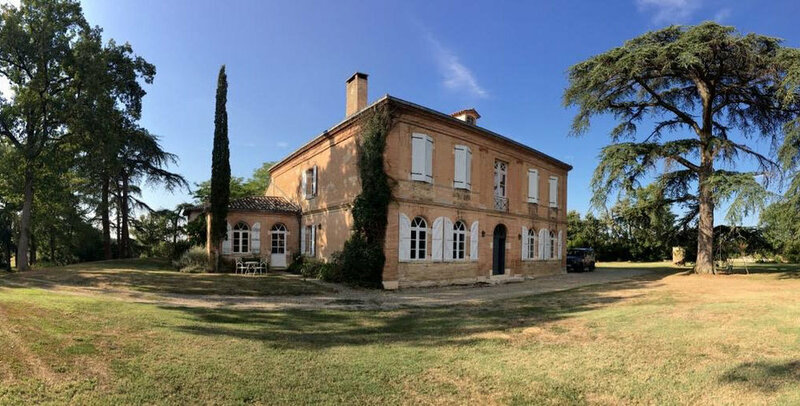 We have dreams of planting an orchard and a vegetable garden, of keeping chickens, and of generally bringing the chateau back to its former glory, but we now have a much better understating of how much help we will need to make this dream a reality. The property needs loving care and attention all year and, even if we were here full time, it’s more than we can manage on our own. We had our first interview this afternoon, with a couple who we met at another chateau while we were house hunting last year. Their tenure has finished, and they are looking for a new guardianship. Caretakers in France are typically offered a home and salary in exchange for their labor in maintaining a property. We don’t currently have suitable lodging to offer prospective guardians, so we are now working with our architect on adapting our plans for the barn to incorporate an independent caretaker’s apartment. The summers can get hot here, and we want to rent the house in the high season, so we’re having air-conditioning installed in the bedrooms. 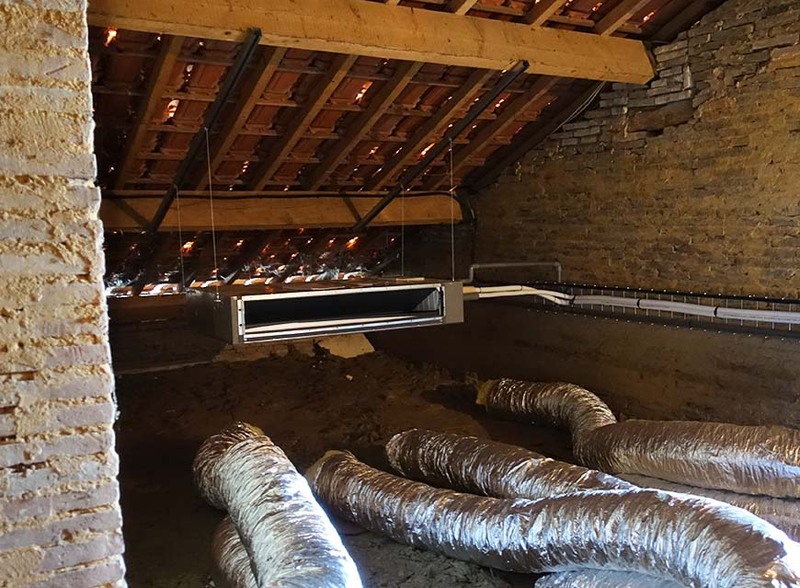 Air-conditioning can look very ugly, especially in a period property where it is clearly out of place, so we’re having the units suspended in the attic with discreet vents in the ceilings of each room. The first air conditioning vents being installed in the ceiling, before the plastering has been finished. The vents are plesingly discreet. From a distance you can't even see them in the celing. The new stairs leading into the attic where the air-conditioning machines are being hidden. Some of the air-con machinery in the attic. We have also begun removing the original wooden shutters from the exterior of the building, in preparation for restoring them. They’re over 200 years old, and in pretty desperate need of sanding and repainting. Some have holes too, from determined woodpeckers (and even though they are creating pesky holes in our shutters, the sound of them still delights me). We are also now working with an experienced stonemason, who is helping us break through some walls to create new doorways for the various ensuite bathrooms we are adding. This is no small task, given the interior walls in this house are 24” thick! One brick is being removed at a time to carefully create this new doorway, and a lintel beam has been installed to ensure structural stability. Progress on Rosie's bedroom has been put on hold temporarily while we await the delivery of her pink bathtub - which was ordered in March! I've ordered most of our building materials and supplies online, due to the limited range available in stores locally, and we are tending to have to wait at least a few weeks, sometimes months, for items to become available. It's been a good learning experience though, because now we know how far in advance we need to order materials before we start remodeling the outbuildings. The dividing wall is up in Rosie's room. The leveling treatment has been poured on the floor in Rosie's new ensuite. The travertin tiles have been laid in Rosie's ensuite. I'm really happy with the natural variation in the stone, and they're very sympathetic with the terracotta tiles used elsewhere in the house. Note: I feel a bit uncomfortable referring to our house as a château because in English it roughly translates to ‘castle’, and I can’t stand the idea of sounding ostentatious. Plus, people tend to think of towers and turrets, and our home certainly doesn’t fit that description! However, ‘château’ means something quite different in France, and it is the accepted and correct term for our house. Châteaux are so commonplace here, and vary so much in size and grandeur, that there is a château in most French villages - even a village as small as our ours with only 56 residents. From Wikipedia; A château is a manor house or residence of the lord of the manor or a country house of nobility or gentry, with or without fortifications, originally—and still most frequently—in French-speaking regions… The French word "chateau" denotes buildings as diverse as a medieval fortress, a Renaissance palace and a 19th-century country house. We fall into the "19th-century country house" category! P.S. Photos of the château and the joys of South West France.